I came to Bali to surf. 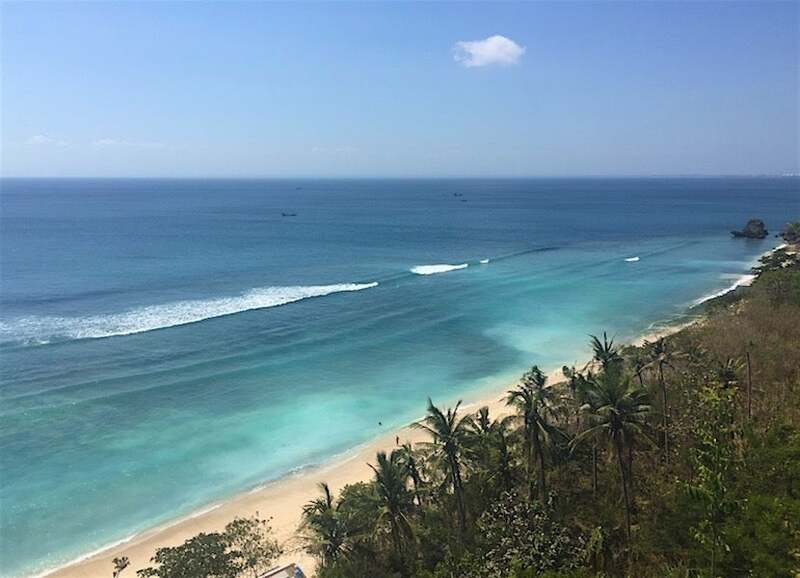 I had originally planned to stay in Canggu for a week, but after I traveled to Uluwatu to watch the World Surf League (WSL) Uluwatu CT final heat, I decided to stay where the pros are. It wasn’t a completely blind move — I had met a fellow surfer, Marco, while watching Johanne Defay and Tatiana Weston-Webb make multiple cut-backs on something like 7-foot waves. He told me that Uluwatu was the place to be to surf, even for a beginner to intermediate surfer like me; so I took my chances, and it turned out to be the best Bali decision I made. I went to Suka Espresso almost everyday. Not only did it have the best Flat White around (in my opinion, of course), but the food is also all sorts of good for you: delicious, fresh, and locally-grown. The interiors of the place is also decorated with up-cycled furniture, so it’s extra sustainable. This might be the place with the most tourists in Uluwatu, but not without cause! This is definitely the place to be if you want to surf — there’s a section of the wave that rides to the left and one that rides to the right. I surfed with a couple of Brazilians (visiting for the WSL I assume) and – inadvertently – with an unknown giant gray marine animal beneath the surface that freaked us all out. “What is it? !” Everyone shrieked at me in panic, thinking perhaps I would know since I look Balinese? 🤷🏽 It looked more like a walrus than a shark, though. As Willy the Walrus is the mascot of the Circus Waterpark in Bali, I shall continue to believe that I surfed with a walrus. Sunday nights here are great for people who love live music (like me! ), but it was also here where I watched advanced surfers slay barrels whilst eating brunch at 10 in the morning. They have a make-your-own-omelette option cheaper than getting one of their ready-made omelettes, so that was a bang for my buck! This is another great beach to surf, but I especially liked it to watch the sunset from the hill. I kept getting a different price from the board rentals, but in the end the cheapest I got was IDR 150.000 for two hours. Take care of your sunglasses, because the monkeys are out to get them! Besides that, the temple has arguably the best sunset view in Uluwatu. The sunset dance is something I’m glad I didn’t miss (there were zero seats left and I had to squeeze in — good thing I’m small). The colors of the sunset enhanced the engaging performance of the Kecak fire dance. This restaurant overlooks another surf break, but it’s interesting to come here because the way is packed with restaurants and homestays built into the hill, it’s almost a labyrinth trying to get to it. I went here almost as much as I went to Suka. First, because it was conveniently right beside my homestay; and second, because the food is good. The road to this beach is across Suka Espresso — which is how I discovered it in the first place. I went here during low tide right before the sunset, and it was truly a soulful experience. The tide was so low I could walk on the corals for about 20 meters. It’s great for observing sea-creatures. For 5-10 minutes, I watched some silly little crab push little stones out of its hole, and a random girl brought me a dead sea-snake. That was a bit weird. I went here twice as well. As you can tell, I like to go somewhere more than once if I like the food. This Italian place is BOMB and completely SLAYED my choice of pizza (try and understand that, will ya). And they served the pizza within 15 minutes. Now that’s good service. The author first travelled to Bali on June 2017 and returned one year later for more adventures. Her first taste of Uluwatu in 2017 was via Trip Guru’s “5 Beaches Tour” of Bali’s southern coast. Little did she know that one year later, she would find herself back at Padang Padang to surf with newfound friends. To see the startup’s full list of curated Bali experiences, click here. Also check out specifically on TripGuru Shared Experiences! Previous articleHong Kong Students’ Best Summer Memories – What’s yours?